Modern dentistry has many solutions for tooth loss, but dental implant restorations are the healthiest and most comfortable way to restore the health, function and beauty of your smile. It is the only solution that replaces both your natural tooth and tooth root with a treatment that looks and feels natural. Dr. James A. Vito, DMD, is a dual board-certified dental implant specialist with nearly thirty years of experience. His trusted care and personable manner give patients dental treatment plans that consistently reflect the high standards in quality care he maintains. For optimal placement of dental implants and beautifully designed restorations, give our office a call. Dental implants fuse with your jaw bone, a process called osseointegration, and provides a permanent, secure, and free-standing anchor for your dental restoration. Implants also promote bone health by stimulating the jaw and preventing accelerated resorption, a process where bone begins to shrink or deteriorate in the absence of a tooth or teeth. Dental implants help maintain the health of the bone which then keeps your smile full and youthful. Dr. Vito has the latest technology and training to make your dental implant placement a success. He uses highly defined 3D images of your internal tissues, nerves, and bones to implant the posts into the jaw strategically. Dental implants can support restorations for a single tooth, a row of teeth, or a full arch of missing teeth. Most implant-supported restorations are permanent; however, there are some that are removable. Dr. Vito custom designs all restorations with lustrous porcelain crowns to give you a beautiful and lifelike smile. This treatment also boasts a success rate of over 95 percent. If you would like to learn more about how implant-supported restorations can replace missing teeth with a treatment that is unmatched in comfort, function, and beauty, contact the dental office of Dr. James A. Vito, D.M.D. Dr. James Vito’s depth of knowledge, skill and artistic vision complement his ability to consistently provide his patients with the healthy, functional and aesthetically pleasing smile that they desire. 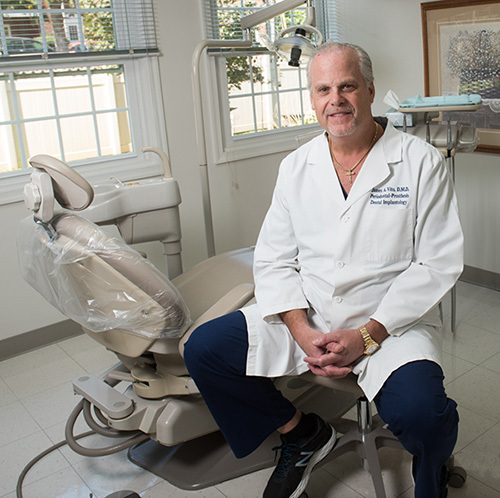 He has been serving patients of Wayne, the Main Line and Philadelphia region for over 30 years. Dr. Vito is well educated and well versed in multiple fields of dentistry including restorative dentistry, cosmetic dentistry, laser dentistry, periodontics and prosthodontics. Dr. Vito is also well versed in the surgical placement and restoration of dental implants as well as the repair of failing dental implants. He can provide his patients with all of their dental needs from routine cleanings to the most advanced restorative or dental implant procedure. To ensure patient safety and comfort, Dr. Vito also offers IV sedation/ sedation dentistry services in his office in Wayne, PA.. Dr. Vito is well versed and skilled in treating patients who are having problems with their dental implants or who have been told that they having failing dental implants. Dr. Vito carefully plans and informs his patients before placing the necessary dental implants to support their individual needs and ensure their satisfaction. The most current technology such as a Cone Beam Computed Tomography or CT scan and the X-Nav 3D vitual Implant Palcement Device makes it possible for Dr. Vito to obtain the highly predictable results patients seek. Dr. Vito is one of the few multi-dental specialists in the world with specialty training and certification in three dental disciplines: Prosthodontics, Periodontics and Dental Implant Dentistry. He received his DMD as well as his advanced training and certification in Periodontics and Fixed Prosthodontics from the University of Pennsylvania School of dental Medicine. He has received extensive training in both the restorative and surgical aspect of dental implants and bone grafting. He has earned three fellowships and two Board Certifications in Dental Implants from The American Board of Oral Implantology/Implant Dentistry and The International Congress of Oral Implantologists. He is one of the few dual Board Certified Dental Implant Specialists in Pennsylvania and the world. Restore the function and appearance of your smile today by scheduling an appointment! Dental implants are an ideal aesthetic and practical solution for a single missing tooth or multiple missing teeth. Contact Dr. Vito’s Dental Implant/Implant Dentistry practice in the Philadelphia, PA area on the Main Line for more information on how dental implants can work to restore your smile (610) 971-2590.